Sporicidin Enzymatic Cleaner is a blend of enzymes in a low foaming solution formulated to loosen and remove dried debris, protein, blood and mucin deposits. It effectively cleans both natural and synthetic fibers that have been soiled with organic and inorganic debris. Can be used in ultrasonic units, automatic washers and evacuation systems. This highly effective cleaner and stain remover has a neutral pH and is biodegradable, nonflammable and nontoxic. Ideal for use as a pre-cleaner mold/IAQ remediation/restoration and household use. Sporicidin Enzymatic Cleaner dissolves and cleans blood, body fluids and other debris present before disinfecting the contaminated areas. 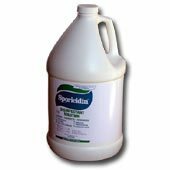 The Sporicidin Enzyme Cleaner is an economical highly concentrated formula - 1 gallon makes 128 gallons of cleaning solution.